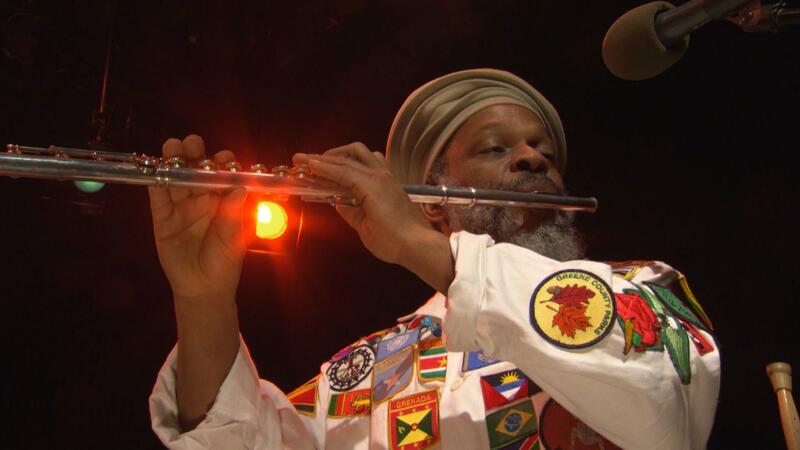 Douglas Ewart brings together dancing, improvisation, spoken word, and jazz in the tpt studio. Artist Bio: Douglas Ewart and the inventions are Faye Washington, Donald Washington, Mankwe Ndosi, Roxane Wallace-Patterson, and Stephen Goldstein. All of them converged on the tpt studios for this session of improvisation, music, dancing, and discovery. Perhaps best known as a composer, improviser, sculptor and maker of masks and instruments, Douglas R. Ewart is also an educator, lecturer, arts organization consultant and all around visionary. In projects done in diverse media throughout an award-winning and widely-acclaimed 30-year career, Mr. Ewart has woven his remarkably broad gifts into a single sensibility that encourages and celebrates. Mr. Ewart was born in Kingston, Jamaica in 1946. Douglas Ewart would probably be classified most conventionally as a jazz musician, but it's clear he bristles at such conventional classifications, and he takes pride in how many genres and disciplines he incorporates into his art. Douglas Ewart brings together dancing, improvisation, spoken word, and jazz.